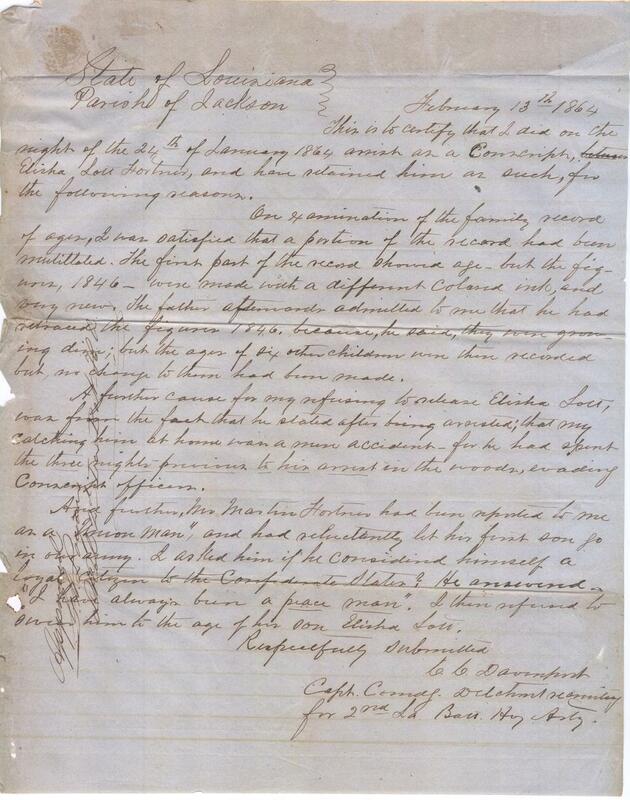 Item description: Report, dated 13 February 1864, of a man arrested for hiding from Confederate conscript officers, his parents forging his age, and his father being a Union sympathizer. Item citation: From folder 22 in the George William Logan Papers, Southern Historical Collection, Wilson Library, University of North Carolina at Chapel Hill. This is to certify that I did on the night of the 24th of January 1864 arrist a Conscript Elisha Lott Fortner, and have retained him as such for the following reasons. On examination of the family record of ages, I was satisfied that a portion of the record had been mutillated. The first part of the record showed age, but the figures, 1846, were made with a different colored ink, and very new. The father afterwards admitted to me that he had retraced the figures 1846, because, he said, they were growing dim; but the ages of six other children were then recorded but, no change to them had been made. A further cause for my refusing to release Elisha Lott, was from the fact that he stated after being arrested; that my catching him at home was a mere accident, for he had spent the three nights previous to his arrest in the woods, evading Conscript officers. And further, Mr. Martin Fortner had been reported to me as a “Union Man,” and had reluctantly let his first son go in our army. I asked him if he considered himself a loyal citizen of the Confederate States? He answered “I have always been a peace man.” I then refused to swear him to the age of his son Elisha Lott. for 2nd La. Batt. Hvy. Arty.